Maybe it was a personal struggle or watching a close friend or loved one with theirs that inspired you to start a career in social services. You can start today by applying for CDI College's Addictions and Community Services Worker diploma program, which will enable you to assist people with substance abuse problems to move towards a clean and sober life. CDI College's instructors in Winnipeg are industry professionals who introduce students to a wide range of subjects including assessment and treatment planning, writing, and file management. In addition, during your course work, you’ll learn about human psychology, addiction prevention and intervention, pharmacology, and other medical areas. Each student must put their knowledge to the test as part of a mandatory clinical placement to get real experience working with addictions clients alongside healthcare professionals such as addictions counselors. As an Addictions and Community Services Worker, you will help assist those who need it most. If you choose to pursue additional training, you could open doors to other positions like addictions counseling as well. The Canadian Addiction Counsellors Certification Federation (CACCF) is the Canadian Certification Board for Alcohol and Drug Counsellors. CACCF offers an internationally-recognized and respected certification, the examination for which can only be taken after formal training has been completed, along with significant levels of work experience in the profession. Graduates of this Addictions and Community Services Worker program will meet the formal training component of the requirements necessary to sit the CACCF certification exam. Embark on a challenging, rewarding, and diverse career path today. Fill out the form on your right. The program requires the students to complete a 4-hour multiple choice exam which is based on all Core Skills courses. Students will be provided a full week of class time in order to review and prepare for the final exam. This subject provides the foundation for further in-depth subjects in the study of addiction. The basic pharmacological nature and effects of a range of psychoactive chemicals are presented, with an emphasis on challenging the myths of which chemicals cost society the most in terms of economic costs and social burden of human suffering. Specific target populations are explored, focusing on women, children, adolescents, ethnic minorities, elderly, the disabled, and those suffering from mental illness. Assessment, intervention strategies, and treatment options are presented, along with the most common problems encountered during treatment. 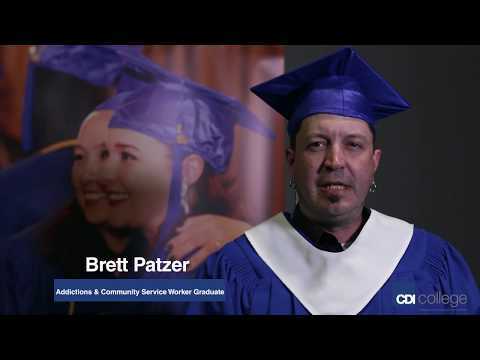 If you're like Brett and looking to make a difference in the lives of others, the Addictions & Community Services Worker Program at CDI College is for you.